Melissa is an Associate Professor in the Linguistics Department at the University of Oregon. Her broad research interests include speech perception, speech production, second language acquisition. She is currently working on a number of projects examining the relationship between speech perception and production, the role of variability in perception and production of non-native speech, and how expectations in perception shift when listening to non-native speech. Zack is a Postdoctoral Scholar, having recently completed his PhD in Linguistics at New York University. His interests broadly encompass phonetics, sociolinguistics, and language contact. The intersection of these interests leads to research questions regarding loanword adaptation and variation, sound processing, second language sound acquisition, and how these all can be socially mediated. Dae-yong is a PhD student interested in L2 acquisition, the relationship between perception and production, and prosody in L2 speech production and perception. Misaki is a PhD student interested in Second Language Acquisition, speech production and perception, foreign accentedness, orthography, and L2 pedagogy. Jonathan is a PhD student who studies the variables that affect the perception and production of prosodic features, such as tone, when someone is learning a second language as an adult. Chasen Afghani is a Linguistics major and Art minor. She loves exploring new languages and cultures and hopes to one day travel as a linguist. Her goal is to become fluent in at least five languages and live in at least five countries. Cydnie is a double major in Linguistics and Russian, East European, & Eurasian Studies. She loves learning about Russian language and culture and discovering the complex science of language as a whole. She is interested in phonetics, historical linguistics, and bilingualism. Her life goal is to be fluent in at least six foreign languages. 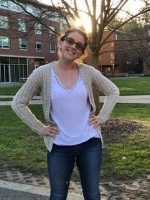 Zoë is a first year undergraduate student majoring in Linguistics. Zach is a sophomore undergraduate linguistics major. He has always been really interested in languages and how they affect the world. Nayelli Mejia is a third year undergraduate double majoring in Linguistics and Psychology. Her interests include second language acquisition, especially among simultaneous bilinguals. She is also interested in the cognitive processes supporting the relationship between speech production and perception. Nayelli hopes to further pursue these interests in her professional career as a speech and language pathologist. Zac is a double major in Linguistics and Music. He is new to the world of Linguistics but is interested in Phonetics, Bilingualism, and Second-Language Acquisition. Karlie is a Linguistics Major and Native American Studies Minor. Her interests include Native languages, her own Tolowa Dee-ni’, and the languages of Oregon. Jennie is a senior undergraduate student in the Clark Honors College double majoring in Psychology and Communication Disorders & Sciences. She is interested in early language acquisition among bilingual children and aspires to become a speech language pathologist. Jennie is also interested in cultural psychology and the role the environment plays in shaping human development and behavior. Tillie is an undergraduate with interest in Spanish, American Sign Language, Linguistics, and Biology. Marin is a linguistics major with a desire to learn about how language works. She is especially interested in adult second language acquisition and how different literacies interact. Kayla is a freshman and currently undeclared, but she enjoys Linguistics and is hoping to pursue it further. Aubrey is an undergraduate student majoring in Linguistics. She is interested in second language acquisition and speech perception/production.